Get more accurate search results in Dow Jones Factiva by using a company code rather than just putting the company name in the free text search box. You can select the company search option, search by name, and click on the name in the company results list. In this case the company code is used but it is not visible on your search screen. 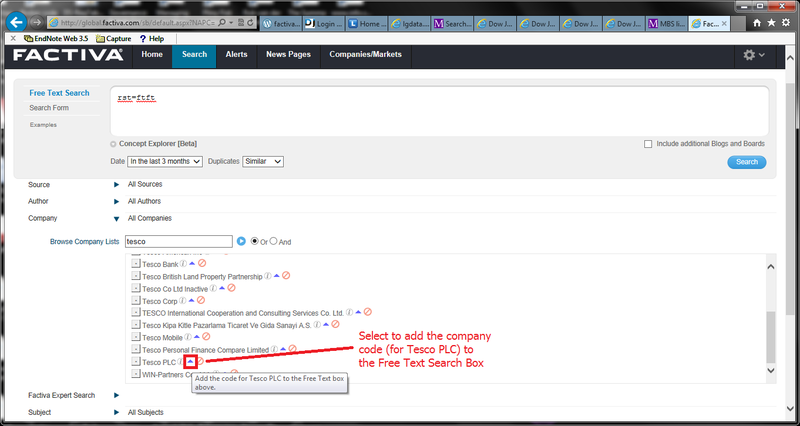 To see the company code – as before select the company search option and search by name but then select the blue pyramid add icon, This will add the company code into the free text search box in the format “fds=mks”, where mks is the company code for Marks and Spencer PLC. It is exactly the same if you want to use codes for sources – for example “rst=ftft”, where ftft is the source code for the Financial Times. If you select the information icon then a popup window will give the details of the company/source including its code. 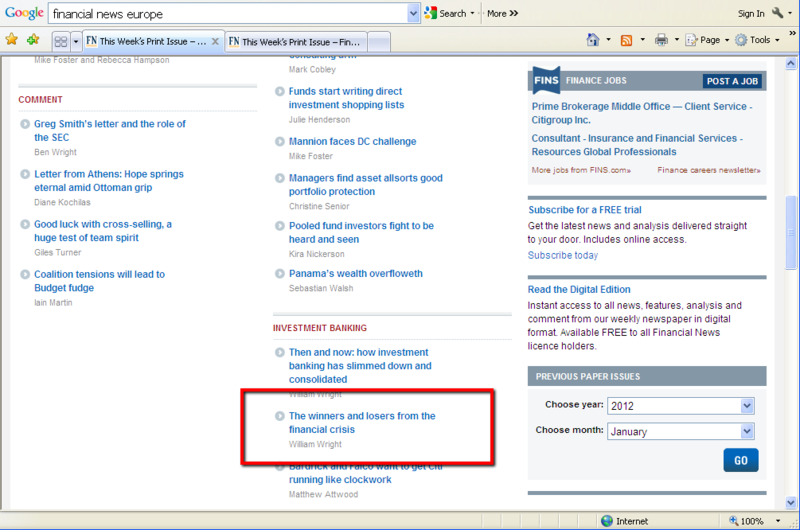 In the screenshot above the source code for the Financial Times (rst=ftft) has already been added to the free text search box. Selecting the add icon will add the company code for Tesco PLC (fds=tsco). You can complete the search by adding the connector, e.g. “rst=ftft AND fds=tsco”, and then click the search button to get your results. One advantage of using explicit search codes is that you can easily save a copy for your search to reuse at a later date. “Factiva” and “Researching Business News” guides from the business and management guides page. Our factiva tagged posts – showing the range of research where Factiva can be useful. Factiva has a YouTube channel www.youtube.com/factiva (this may include features not available on the University of Manchester academic subscription). You can see the effect on the market using Bloomberg Professional to chart intra day data for an index (S&P 500 below) or individual share. Bloomberg News also has a report “Associated Press Twitter Account Hacked in Market Moving Attack” (Bloomberg News April 24 05:01). We should probably not consider it surprising that social media has the power to influence markets, nor that there is a tendency for traders to react first and they check the authenticity of information. Bloomberg Professional has a function TWTR (Twitter Filter Builder) that allows users to build a twitter filter according to how they want to monitor the market – including seeing what is trending on Bloomberg Social Velocity (BSV). Search for “Twitter” on Bloomberg DOCS and one document offered is “Chapter 3: Lessons Learned from Social Media” (Halloran and Thies, 2012). Halloran, M. and Thies, C. (2012) “Chapter 3: Lessons Learned from Social Media” from The Social Media Handbook for Financial Advisors: How to Use LinkedIn, Facebook, and Twitter to Build and Grow Your Business. Available at: Bloomberg Professional Service [online subscription service] (Accessed 24 April 2013). Students and staff can make use of University of Manchester Library resources to browse recent news. Factiva (from Dow Jones) has a News Pages tab that offers simple access to top newspapers worldwide (most recent two weeks). Select Global from the drop-down list and you get: The Wall Street Journal, The New York Times, The Australian, The Times and scmp.com (South China Morning Post). Select United Kingdom and you get: The Daily Telegraph, The Times, The Guardian, The Independent, The Wall Street Journal (Europe) and The Economist. 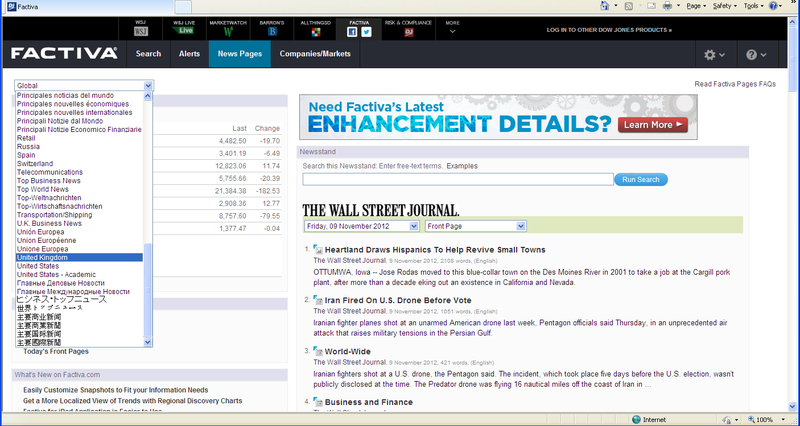 Note: Factiva provides News Pages in several languages in addition to english. Factiva does include access to The Financial Times but not through the News Pages – you have to use the Search tab and select The Financial Times as your source. For a list of news databases goto the Business and Management databases page and scroll down to the Databases: Business News section. 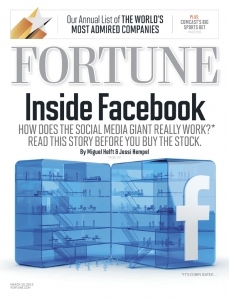 The March 19 2012 (Volume 165 Number 4) issue of FORTUNE includes its annual ranking of corporate reputation by industry and a lead article by Miguel Helft & Jessi Hempl “Inside Facebook: how does the social media giant really work? Read this story before you buy the stock”. The library has access to Fortune through the journal database Business Source Premier. Business Source Premier’s access to Fortune seems to be limited to text (no pictures), but this does mean that you can listen to the text rather than reading it, and have it translated into a different language. The Library does not subscribe to Financial News but you can get access to the articles in the weekly newspaper through Factiva. News article: Wrigth, W (2010) “The winners and losers from the financial crisis” Financial News, Issue 793 Monday 19th Mar 2012. On Factiva this article is available but slightly tricky to find. Earlier post: How Business News can enhance your Research – use the Tag cloud on the right-hand side for all Factiva-related posts. At 07.00 AM on Mon 16th Jan 2012 Carnival Corporation and plc issued a “Required Announcement on Financial Impact of Costa Cordia“. The announcement then provided information in accordance with financial disclosure regulations. The full text of the announcement is available on Bloomberg and several other business databases. If on Monday 16th you want to see how the market reacts to the Costa Concordia tragedy, then Bloomberg is the best database. It provides an integrated view covering the news and the Carnival share price (price down and an increase in trading volumes), and the news is the most read story of the day. PI Navigator is the easiest database for going straight to the regulatory annoncement. You just lookup Carnival Plc and search. 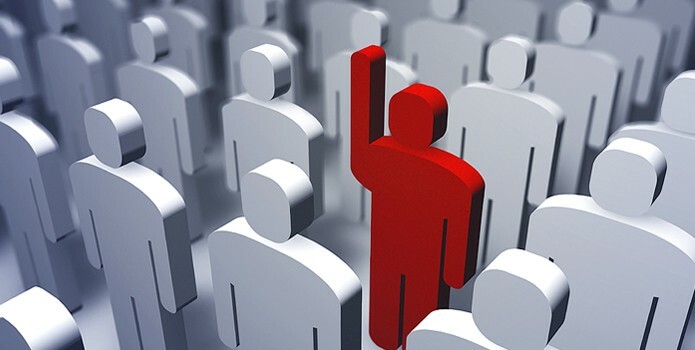 However, because PI Navigator only covers the regulatory news and regulatory filings of companies, you have to use another database for additional news or financial market information.